This is FUN! We're playing Foto Frenzy here AND on our Facebook Page! Playing is optional, but swooning is highly encourage. The Cats From Sydney picked #1111, my most recent photo. Gloman bought another flashy box last weekend and was "testing" it. I look like I was "testing" him out. You'll get a kick out of this. Most of you know that Gloman is the resident photographer here in the townhouse. It's a hobby he takes VERY seriously. He does an incredible amount of research and studying online through a number of pro photography forums. There's a tradition on the forum. Whenever someone gets a new camera, they post their very first photo taken with it. And.....wait for it....it has to be a photo of a CAT. 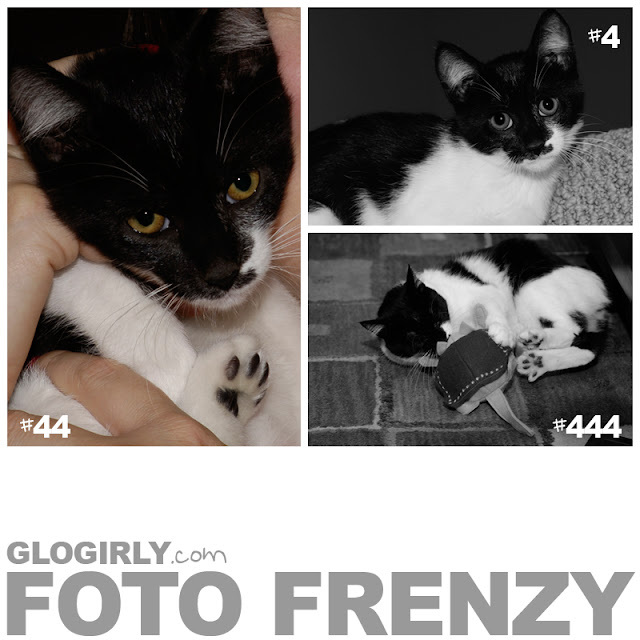 Wanna play Foto Frenzy? Just pick a number between 1 and 1,111. We'll feature your photo pick in an upcoming post! Here's a pick from one of our Facebook friends that we featured last night on FB. It's a triple play of cuteness. They picked #4, #44 and #444. Hmmm, a handsome man-cat also requested number 4, and was not disappointed!! hahaha! None of gloman's new camera forum buddies will believe him to be a dog person now :) His cover was blown by first photo of a kitty! We love those photos with number 4's! Love that tradition! Every picture should have kitties in it..
That photo forum sounds awesome! My human is curious about what new camera Gloman got. She is curious about such things (trust me, *I* am not!). Amazing pictures, especially 444 ! You're such a cutie ! I'm just impatient to see photo 13 ! Aahhh....we pick well. #1111 is pawesome! Brad is going to ask you to marry him, officially. And no, you don't have to be Sebastian's stepmum. purrr...meow! How about photo 246? This is fun. 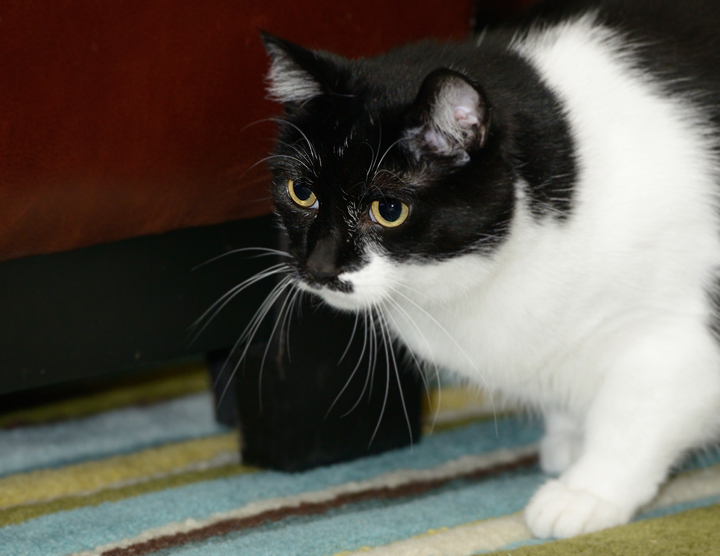 Gloman is a great kitty photographer. The Mum is a photographer too, but she gets annoyed because all her kitty pictures comes out crap. Those are all so very good!!! Sigh. I wish I had a real photographer and a blogger who could design. Katie, you don't know how lucky you are. Wait, if you visit my blog, you already do. you are one gorgeous kitty! Aaah one day we hope to have a decent photographer help us with our efforts with feral cats. Hey it's National Feral Cat Day! Christine got cat-suited up for the occasion. Gloman is one talented human! Of course, he's got YOU to take pictures of, Katie. How could he possibly take *bad* picture??? All your pictures are good, Katie! My Mommeh just sets the camera for automatic, presses and hopes! We sure are enjoying Foto Frenzy! We think that Gloman is pretty darn good with his new camera. You photograph very well Katie. We love the tradition that all pics should have a kitty! noy only photo frenzy is going on here, but yous has new buttons! Me love your 4 series! I too love the 4 series. You have mastered the sad eyes look!